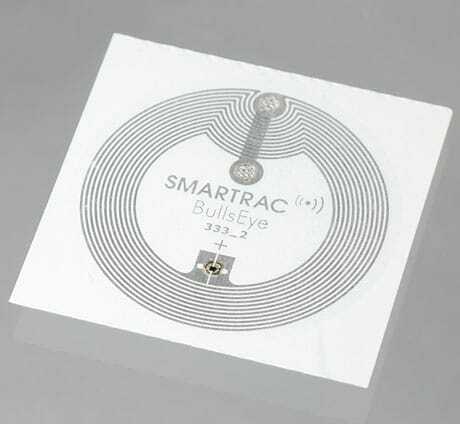 NFC and RFID tag manufacturer Smartrac has launched a new tag that is designed to provide a high performance and cost-effective option for high volume NFC applications that require simple URL addresses and unique identifiers but little additional memory. Suitable use cases for the BullsEye nTag210, Smartrac suggests, include product authentication, advertising, smart poster and postcard applications. The new tag uses NXP’s nTag210, an NFC chip that has a range of built-in security features and comes with unique ID (UID) mirror functionality. This enables the chip’s serial number to be presented as part of the encoded URL address, allowing every tag to be seen and read uniquely from an application perspective — without the need to encode tags with variable numbers. The new tag conforms to the NFC Forum Tag Type 2 and ISO/IEC 14443 Type A standards. It measures 38mm across and includes 48 bytes of user memory with password protection as well as UID. “The Smartrac BullsEye nTag210 NFC tag is the ideal solution for volume applications with limited memory need but maximum tag performance required,” the company says. The tags are available in sample quantities for testing now with volume deliveries due to start at the end of October 2013.